HP unveiled a new suite of four secure, enterprise-class laser printers. These printers borrow security technology from HP's PC division, allowing businesses to keep their documents secure by monitoring intruders, stopping malware attacks and ensuring that the BIOS is free from corruption. The March 2015 "Annual Global IT Security Benchmark Tracking Study" published by the Ponemon Institute reveals that 53% of IT managers realize their printers are vulnerable and 64% state that their printers are likely infected with malware. Yet, despite these numbers, IT confidence in printer security remains low. To help make printers, and the transmitted data, secure, HP brings its client endpoint security to its enterprise laser printers. These measures, including HP SureStart, Secure White Listing, and run-time intrusion detection technology, sit on top of common baseline security measures, including device protection, data privacy and encryption, the latest key security standards and access control. 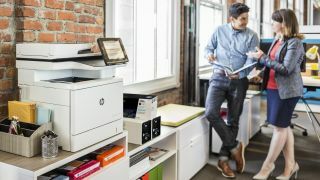 If these features aren't hardware dependent, HP claims that these security features can be implemented on printers as old as 2010 through firmware upgrades. This means that if users aren't ready to upgrade to a new printer, they can update their printer to become more secure. The first feature, known as HP SureStart, is hardware dependent as it relies on a secured hardware controller, will only be available on this fall's lineup of new enterprise lasers. This technology uses a hardware-based Root of Trust to compare the BIOS against a golden copy. If the hardware controller determines that the BIOS has been attacked or corrupted, it will re-flash the printer to the previously safe start part from an electrically isolated area of flash. This helps reduce downtime as the printer doesn't need to be shipped to be reflashed, and businesses don't have to wait for a service technician. Whitelisting also helps protect the printer against running tampered code. Using a digital signature, the CPU on the printer will determine if HP-authentic code is loaded. If the signature doesn't match, the device will reboot and IT will be notified. With intrusion detection, the printer will continuously scan memory to check for intrusion. If that is detected, then the device stops and automatically reboots to a good condition. These new enterprise-class printers contain similar toner technology as HP's recent consumer refresh, allowing HP to make the LaserJet printers faster, smaller and quieter. These printers are up to 24% more compact than the prior generation and up to 71% faster at printing two-sided documents. HP says that the printers deliver up to 46% faster first page output and a 61% faster wake up time from sleep. If your business is running a lot of print jobs, these savings can add up to significant time savings. Additionally, there is faster setup times, optional pull-out keyboard to allow you to easily type in email addresses for scanning, a cave light so you can see the printed pages on the output tray and the convenience of a built-in stapler on multi-function models. Like the consumer models, there is Wi-Fi, Wi-Fi Direct, AirPrint 1.4, ePrint and NFC tap-to-print for printing from a smartphone or tablet. The portfolio includes the LaserJet Enterprise M506 ($649, £418, AU$910), the HP LaserJet Enterprise MFP M527 ($1,799, £1,160, AU$2,522), HP Color LaserJet Enterprise M553 ($599, £386, AU$840) and HP Color LasetJet MFP M577 ($2,199, £1,418, AU$3,083). Except the Color LaserJet Enterprise M553, which is already available, all these printers will be coming this fall. The M506 can print at up to 45 pages per minute and has a 60% increase in toner capacity, which should help reduce print costs. The M527 feature similar innovations, but has a larger 8-inch pivoting color touchscreen. The M577 has a 40 page per minute print and copy speed and color cartridges that can last for up to 9,500 prints.